Heat oven to 350°F (325°F for dark or nonstick pans). Grease 2 (9-inch) round cake pans with shortening or cooking spray. Make cake mix as directed on box, using water, oil and eggs and adding 1/2 cup lemonade drink mix. Pour batter into pans. Bake as directed on box for 9-inch rounds. Cool 10 minutes; remove cakes from pans to cooling racks. Cool completely. Place 1 cake layer on serving plate; spread with frosting. Top with second cake layer. Frost top and side of cake with remaining frosting. Garnish with lemon peel and mint. Yellow cake mix can be used in place of the vanilla cake mix. For a special touch, reserve some of the frosting to pipe around the top and bottom edges of the cake. 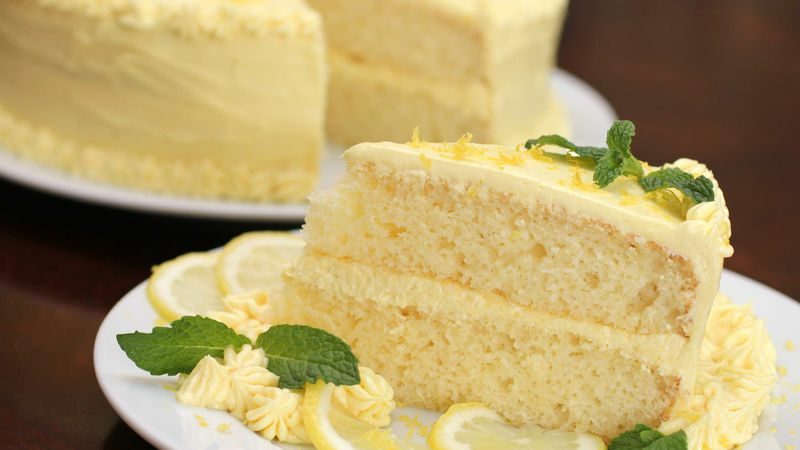 Lemon slices also make a pretty garnish for this cake.